This page features art projects, both individual and collaborative, by young artists around the world. You are welcome to submit a project for publication! 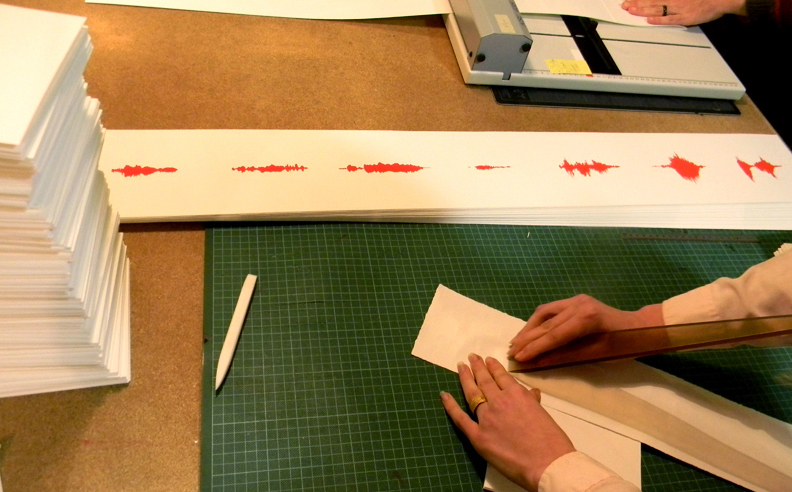 Sound Prints is about linking the experience of daily rhythm and sound with the physical environment. The painting installations visually describe the sound present at a particular moment. The painting is done directly onto the natural landscape, expressing an interpretation of the present sound printed on the land. As the sound changes in the environment so does its visual representation. The installation suggests that a present moment is part of a continuous evolution. The installation is modified with time by the weather and the elements that either wash away, extend, or transform the colors and forms. The photographs serve as documentation of the painting installations. 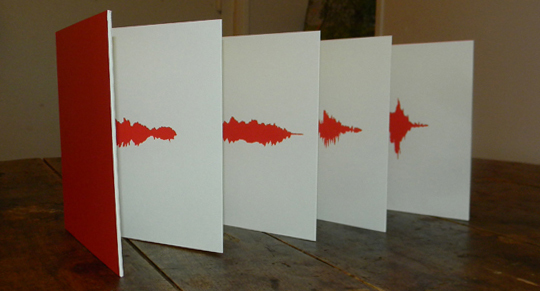 They capture the visual interpretations of the sounds present at one moment in time and space. Sometimes the painting waswashed away or modified only moments later; other times the sound imprint stayed intact for days. The painting installations were done during a one month voyage through Costa Rica in September 2014. The specific environments and times were chosen because they were the landscapes and sounds that played a role in the journey, like the landmarks of an experience. The Sound Prints series has been a personal exploration of how one can experience each present moment differently, and how the sound and image of an environment can be perceived uniquely in that moment. Rachel Marks is a young artist living and working in Paris, France. She earned a BFA from Oklahoma State University and a Master’s degree at the Higher School of Art and Design in Grenoble, France. Rachel has exhibited her work internationally in the United States, Italy, England and France. Check out more of Rachel Marks' work on her website. View Rachel Marks' EAS profile here and a previous project on sound by Rachel Marks titled, "Color Language." "Highway Sign, Philip, South Dakota, USA"
This series explores the nature of landscape photography through imagery culled from Google Street View’s extensive visual database. Landscape photography, by definition, is a passive form of photography, one that relies on an uncontrollable source of beauty: the earth. Landscape photographers unflinchingly appropriate this beauty as content for their art, and in doing so they claim authorship of a force that exists independently from their gaze. Incidentally, Google’s monumental visual mapping project, Street View, has captured many images that share formal and compositional similarities to landscape photographs produced by artists. "Ice Hut, Spitsbergen, Svalbard, Norway"
Since landscape photography is a diluted form of appropriation art, the main difference between these two sources of imagery is artistic intent. I chose to not only embrace this passive approach to photography, but to take it one step further by shedding my camera altogether, in favor of decontextualizing and reframing photographic compositions initially captured by Google. Instead of applying an artistic eye to the physical outside world, I have chosen Google’s seamless visual map as my photographic terrain, and curation as my method of creation. "Countryside in Winter, Kirkenes, Norway"
I have chosen a refined selection of images found within this virtual reality, specifically those that function as “fillers”–images used primarily to maintain a sense of visual continuity throughout the interactive map. Without these images, the Street View interface becomes essentially a guidebook, highlighting only specified destinations and addresses. It is the “filler” image, photographed blindly and by chance, that not only stitches together this digital world, but that exposes a more humble reality. Overlooked by most users seeking specific locations and points of interest, these photographs reveal a beauty in landscapes we have unconsciously chosen to ignore. Elizabeth Eisenstein is an artist currently based in Los Angeles, CA. Her work centers around the photographic image, both in the traditional sense of the term (film and digital photographic stills) as well as appropriated digital imagery found primarily online. She is a 2012 graduate of New York University with a BFA in Studio Art. View more "Street View Landscapes" on her website. Binary code translations of well-known texts in Emily Lazerwitz's "digital hand-typed tapestries"
Digital Tapestries: I create work that takes language, and in the case of my tapestries, manipulates it so that it cannot be understood. I do not change the content of the text or make it illegible. The ability to read the text is still possible, but most would not have the time or desire to attempt to read it. I chose a text that means something to me. Recently they have been related to mathematics, such as chapter 7 of Alice in Wonderland, or textiles, such as the myth of Arachne. I translate the chosen text into binary code through an algorithm. The algorithm converts each character including spaces into a number and then that number is further translated into an 8 bit number consisting of 0s and 1s depending on its relationship with the powers of 2. Then I take these numbers and add spaces to them. The spaces correlate to a pattern. The pattern is based off of textile patterns that I think are relevant to the text. Sometimes they are more literal in their relationship and sometimes not. I finish when the last digit is in place. It should be noted that spaces are not read in binary code, and therefore do not change the meaning of the code. Thus, if the pattern was inserted into the reverse algorithm, the text would read back exactly as it was. Hence, the content of the text has not changed, simply the context, several times over. Once the process starts my decisions become more absolute. Like any system, the more decisions one makes, the fewer options there are. None of my work is entirely finished. There still are more options. I like to think I make a textile when I finish a work; however, a more accurate description would be a textile pattern. The process itself is weaving, yet the outcome is one that has far more potential than a traditional textile because of the very reasons it is not one. Emily Lazerwitz is a graduate of the Slade School of Fine Art at the University College London. 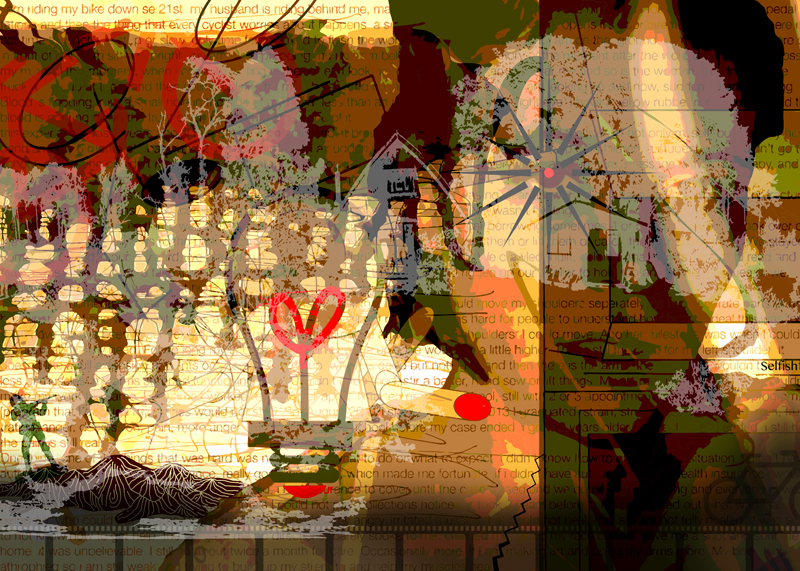 View more digital tapestry works on her EAS profile here. The current era of globalization and immigration has brought about an America in which nine million individuals, or 2.9% of the population identify as mixed race. The search for the understanding of this identity becomes increasingly important as society begins to identify “mixed race” as a racial category and subject it to the same prejudices and discrimination as other minority races. Today the mixed race individual is often projected through a lens of celebration, exoticism, or otherness that simplifies the individual. Thus, it is increasingly important for the personal accounts and experiences of mixed race individuals be represented. Processes of self-exploration are vital starting points for generating counter-narratives that expand the meaning of mixed race identity in today’s context. I am a half Japanese, half American individual and through the practice of traditional Japanese woodblock printmaking, influenced by the Ukiyo-eprints of 18th Century Japan, I examined my personal narrative. The phrase “Look Again” is loosely translated from the Japanese phrase “mitate”, a genre of Ukiyo-e in which prints reenact or parody classical literary or historical scenes within a contemporary setting. In my work I reset the stage for mitate-e so that my self and my world represented the contemporary, and the mitate-e of Edo Japan became the classical. I carved high quality Japanese shina and cherry wood with Japanese knives and used rice paste to adhere Japanese sumi ink and watercolors to handmade washi paper. The challenge of recreating Japanese printmaking in Portland, Oregon illuminated the difficulty of transmitting history into a new time and place. The preservation of a traditional Japanese craft required a delicate and hands-on process that became as vital as the product. My actions of hand carving and hand printing became an act of identity-forming, as I became both mentally and physically closer to the unique art of Japanese printmaking. M and T (Figure 1 and 2), show female bust-length figures modeled after the Edo period okubi-e format. Both figures are based on Kitagawa Utamaro’s close up beauty portraits which use physical characteristics to categorize women. By portraying the multiracial bodies of my sister and me, the difficulties of categorization based on physical terms are brought to light. M and T, reveal the inadequacy of such a system by representing physical features for which there are no real categories, the gestures—picking at eyelashes, pulling out hair— physically embody the anxieties that accompany societal tendencies towards categorization. Unlike Utamaro’s portraits of women caught unaware in their “natural state”, the prints capture self-conscious moments where the subject is aware that their features are displayed and examined. This reflects a common experience for mixed race individuals: Just as an art history scholar might look at an Utamaro work and attempt to decipher the rank or category of the woman depicted, so too do people examine mixed race individuals based on their physical characteristics and attempt to identify their race. A Childhood Story (Figure 3), retells a non-traditional personal narrative through traditional Japanese storytelling devices. Read from right to left, the story itself loosely follows the characters of my sister and me. The story depicted is a piecemeal of personal memories, aural storytelling, old photographs, and even Google Maps. It highlights the fragmentary nature of exploring personal narratives, which plays a vital role in the formation of an identity. I show this fragmentation through a non-linear timeline: in the center a recent painting of my sister hangs in the hallway of the house where she is still a child, silhouettes of my sister and me all grown up are perched upon a roof while our younger selves sit for photos in the room below, to the left my grandmother plays with me as a baby while my adolescent self bathes in a natural hot springs a short distance away. The narrative begins on the right with the Western-inspired, one-point perspective used by many ukiyo-e artists. This breaks down in the second panel where three dimensional space is represented with simple diagonals rather than a vanishing point, as was done in very early Asian paintings. Through these varied perspectives I explore multiple facets of my world, from my childhood home in Oregon to my mother’s Japanese hometown, from my infant-hood to my adult-hood. As a single “big picture” they represent the unique complexities of my history and my identity. This reflects a freedom from categorization, from being forced to choose between my American identity and my Japanese identity. Those identities, like the visual elements within this triptych, are intertwined and inseparable. The universal mixed race experience is near impossible to convey, as a similarity in racial heritage is by no means a significant commonality between individuals. Yes, students now have the option to self-identify as “mixed race” on standardized tests, but what does “mixed race” really mean? For both Two Portraits and Childhood Triptych, the personal experience takes center stage as I shuffle through family photographs and hunt through memories in order to convey an experience that is honest and untold. I combine the “western” views I learned growing up in the United States with my new knowledge of traditional Japanese printmaking in order to create an image that is rooted deeply in both Japanese and American cultures. Through learning and performing methods of Japanese printmaking I created a tactile and intimate connection with an exquisite tradition, and participated in the transmission of knowledge and history that is vital to my identity. By resisting the urge to attempt to come to a universal conclusion about mixed race identity and by denying that my experience fits into some kind of category for what it means to be mixed race, I assert perhaps the few truths on the matter: that each experience is unique, that each identity is formed differently, and that each story that is told has the potential to open up a dialogue for further illumination of what the mixed race identity is. Maria Maita-Keppeler is a recent graduate of Reed College where she studied Studio Art with a focus on Japanese Woodblock Printmaking. She is currently living in San Francisco, California and working on organizing the EAS “Translations” show while pursuing her passion for playing music. The need to define U.S. citizens racially and ethnically has always permeated American society and culture. Usually the word “Hispanic” will suffice in describing almost 665 million humans that live in the United States, Latin America and in Spain. Classifying such a large group of people under one category is detrimental on many levels. This action neglects the importance of truly understanding of a group of people and their culture. These portraits of “Hispanic” people are meant to show the diversity that exists in Latin America and Spain, and that there is no stereotypical “Hispanic”. American cinema frequently portrays “Hispanic” people as drug dealers, landscapers, or maids. My portraits are meant to defy the stereotype of a “Hispanic” and emphasize the physical differences of each person, alluding to cultural differences as well. The idea that all “Hispanic” people are dark-skinned and have brown eyes is false, which becomes evident in these photographs. Two subjects have blonde hair and blue eyes. “Hispanic” people simply do not look the same. Speaking Spanish is the only factor that unites most “Hispanic” people, but it is something that cannot be seen. Through these portraits I aim to break down the boundaries produced by the construction of race. I am trying to show that race is not a real thing. It is an idea that is real for most Americans and that has seeped into our institutions and laws. Physical differences should not determine opportunity in life, but in America, they do. White privilege exists. Stereotyping and racism fuel this unjust reality, and they both need to end in order to achieve equality. The point of these photographs is to break the stereotypes that revolve around “Hispanic” peoples, thereby assisting the demise of racism. Jillian Grant is a photographer based in San Diego and Massachusetts. She attends the University of San Diego where she is majoring in Photography and minoring in Ethnic Studies and Spanish. 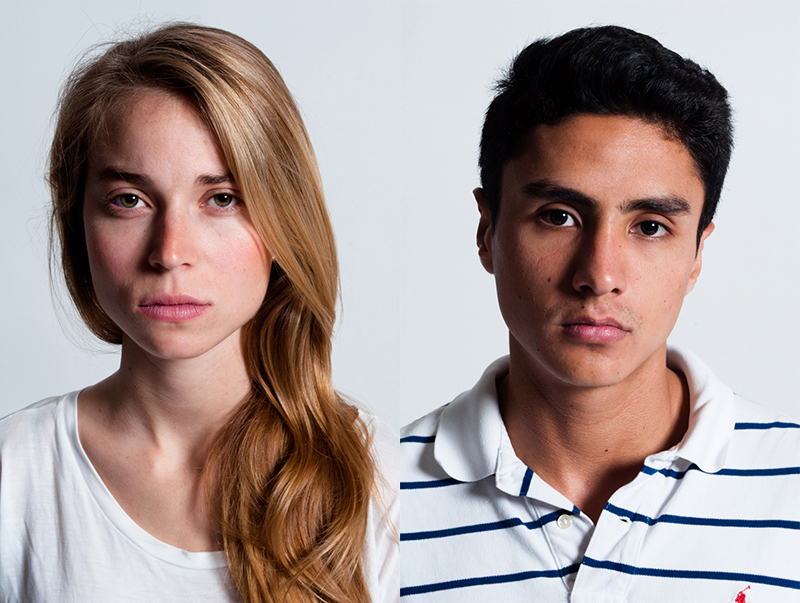 Check out more images from "Define Hispanic," and more of Jillian Grant's work on her website. In its second year 'Scribble it Down' presents Parallel Lives, featuring artists from Israel, USA, UK, India, Pakistan, and Serbia. The theme Parallel Lives points to the artistic process of 'Scribble it Down' by acknowledging and addressing the artists' parallel existences in different places. As the files were passed between artists, they exposed each other to their different lives and perspectives. These stories intertwine and turn the digital series into a visual journey of a collective experience. 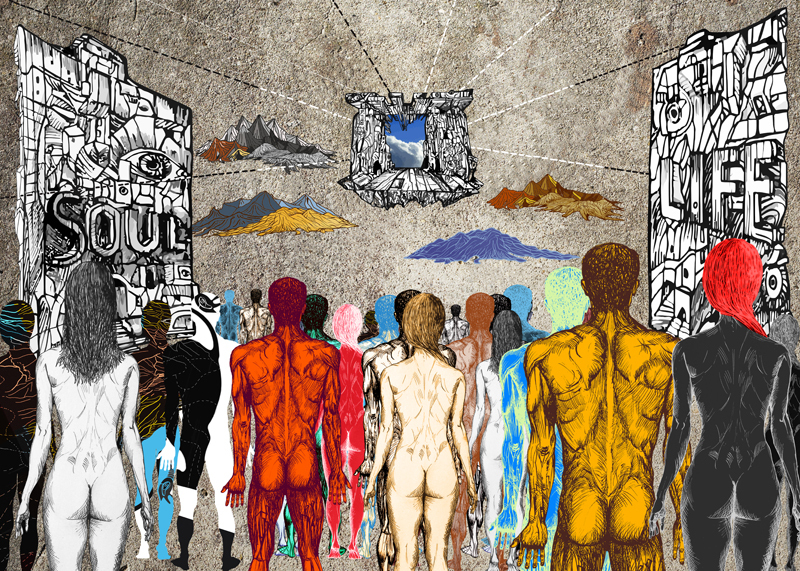 Parallel lives establishes new forms of connections between people that goes beyond the visual conversation facilitated through the project's artistic process. The artists used Facebook to establish relationships with each other and to engage in virtual group discussions about art and life. Through this process they became a community of Scribblers who took on a unique and shared identity. 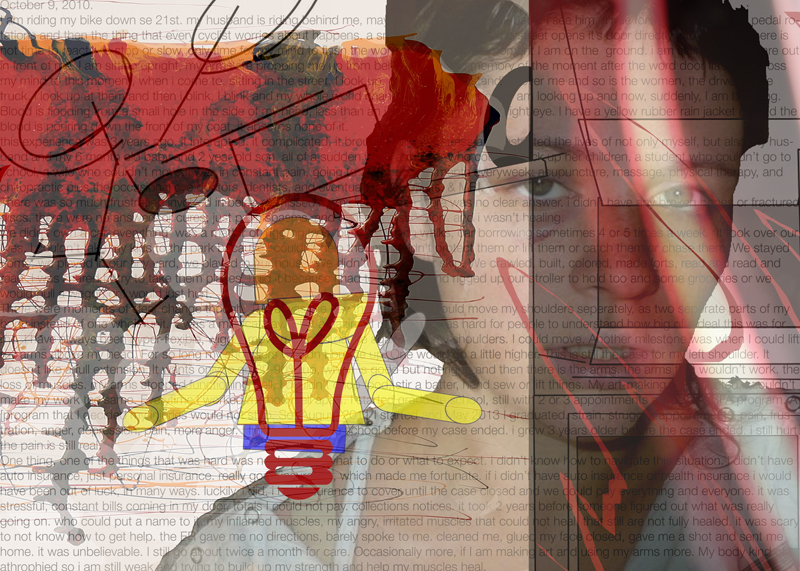 This year "Scribble it Down" also experienced the downfalls of a digital collaboration. One artist ceased communication, and with him disappeared the final stage of his group's piece. It is easy to shed ties when one's sole connection is virtual; this experience illuminates the difficulty of creating lasting connections and loyalty. This is "Scribble It Down"'s biggest challenge. This project is a collective creation and my role as a curator is to understand it. I encourage a certain type of work, method, and theme, but where the work goes from there is open and left to be decided only by the participating artists (Scribblers). Traditionally the text that accompanies a visual work plays an important role, especially in modern and conceptual art. The same was true during this project. The artists were required to represent themselves, who they are and what interests them, a task that required communicative abilities. Adding a text became an essential part of the project, as words play a crucial role in self-representation. The strong power of words stirred a variety of reactions due to cultural differences towards certain issues. The white house - white trash discussion: when a “white house” architecture was created by one artist, the second artist, who is interested in white spaces, changed "white house” to “white trash”. As the piece continued its journey, the phrase “white trash” stirred a strong emotion in the next artist, who respectfully changed the template to black and added text that encouraged tolerance and fought racism. This interaction, which happened both in the visual work and in the discussion group, showed the importance of creating a discussion and of raising the understanding of the different ways in which images and words are perceived. The artists have used a lot of existing images, like family portraits, pictures from travels, etc. This was due in part to comply with the requirement of representing oneself and one's life, but also to use the project to deal visually with past memories, images from local surroundings and more. Images of buildings and houses are very dominant. An artist who sees her family as her main inspiration has used images of her family as an important element. "The first artwork is the one that I called The Puzzle of the Universe. It referred to freedom of choice, to secrets of...who we are. Who convinced us, that we are alone in this Universe? Why is there this secret? For me, this was interesting, because all artists in this project come from different religious, national background and believes." "This was my first initial work for this collaborative project, and upon receiving a blank page I struggled to decide how to start. After reading back through the emails from Einat, about how we could convey the main issues relevant in our current lives and connect ourselves to our emotional centres, I began to see how I was partitioning these issues. I used the blank page as a tool to express my current state with regards to anger and emotion, with regards to a conversation that was burdening my childhood memories and security. 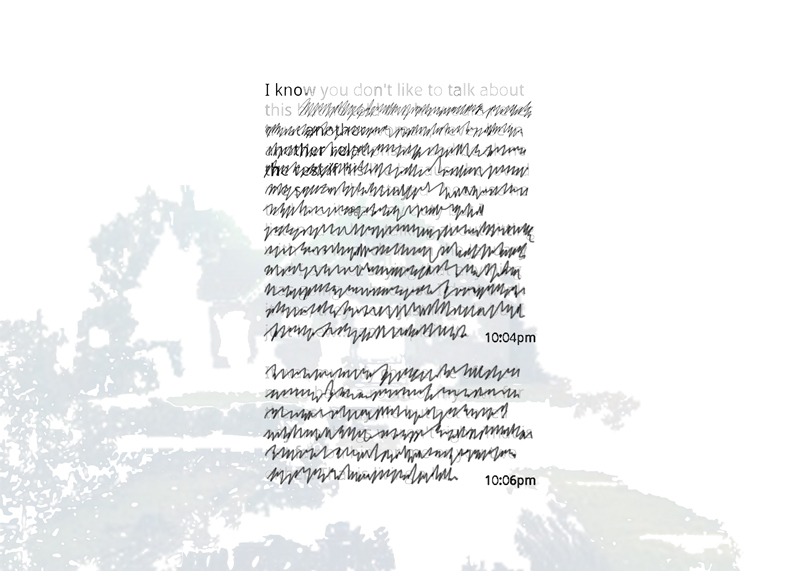 Within this piece I used "sous rature" (erasure) as a tool to remove the parts of the text that I feel shouldn’t have been said to me, leaving only the words ‘I know you don’t like to talk about this but…’ thus allowing the viewer to see how this other information was still relayed to me. I was really interested to see how this piece would move forward and into the collaboration.Now I feel as if I can see how the other artists involved related to my emotions and pushed the work further to create my favorite piece." "I always received images that had text, and not fully readable. I was actually grateful for that, it helped me decide which direction to explore. 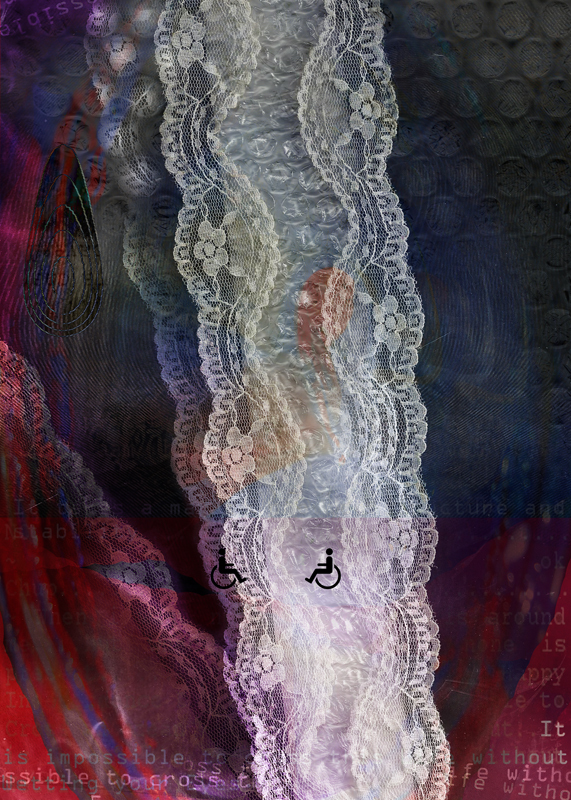 For example this dark-blue-red-purple-fingerprint-wood-handicapped-textures-image, impressive and atmospheric: it says "it is possible to cross an ocean without wetting your legs, but! it is impossible to cross this life without wetting your eyes" so I went towards the crying/being torn theme - I printed the image out, cut it through the middle, laminated it, sewed it with lace and some gap in between; in the gap there is now bubble-wrap, which would suggest that it is protecting something very fragile (our heart or emotions or...) (this was the only time where my work was beyond photoshop and involved mixed media). I scanned my result and placed it over the given image, then decided how to combine the two. In the process I lost the wood (but didn't want to) so I took its "eye", flipped it upside-down, and used it as a tear. The handicapped were also gone but I placed them back, and now the work is more about "emotionally handicapped", which at that point of my life, I feared I was too!" "When I saw this I instantly knew what I needed to do, which was to overlay these vehicles over the people. A large part of why I did it was in response to the culture I live in, which is ridiculously car dependent. I saw these people moving in droves and I felt like the next layer, or step, was the vehicles. I saw it in red, it was absolutely a visceral, instant understanding for me of what I should do." Featured in the exhibition, Vinyl: the Sound and Culture of Records at the Oakland Museum of California. Through photographs and audio recorded conversations, Raphael Villet spent four months documenting the many different relationships that people have to records in the Bay Area. He brings these observations and conversations to the current exhibition "Vinyl: the sound and culture of records" at the Oakland Museum of California. 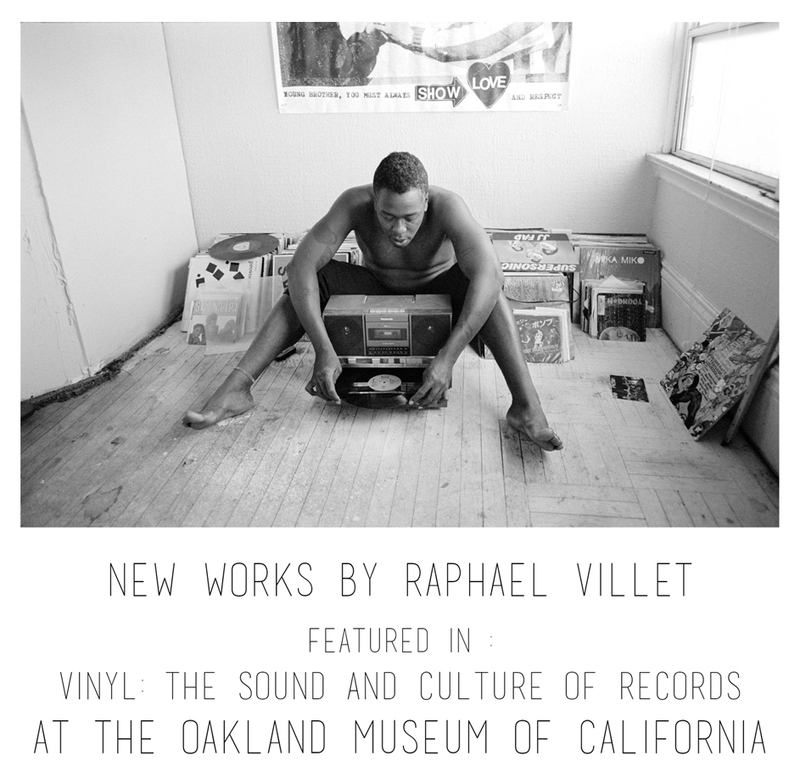 Featured in OMCA exhibit are thirty five photographs and a fifty five minute audio documentary by Raphael Villet. OCMA Exhibition, "Vinyl: the sound and culture of records" on view till July 27, 2014. Conducted in January through April of 2014, these recordings bring you into the homes and hangouts of a diverse cross section of Bay Area residents. Starting with his friends, Raphael Villet sought out big and small time record collectors, event dj's, radio dj's, bands, and record label owners. The goal was to bring insight into what records mean to so many different people here in the Bay Area. Peer into the lives of people like Brontez Purnell (top image) a resident of Oakland, CA who, while amassing an eclectic collection of music for djing and personal inspiration, has also recorded his own music onto vinyl. Or Peter Avilla, from Richmond, CA who has a 45 rpm record player in his 1955 Cadillac, and a fully loaded jukebox in his kitchen. Hear Alec Palao of El Cerrito, CA talk about discovering the complete original recordings of the once prolific Music City record label of Berkeley, CA and the efforts it took to re-release the collection and bring royalties to all those long gone artists. 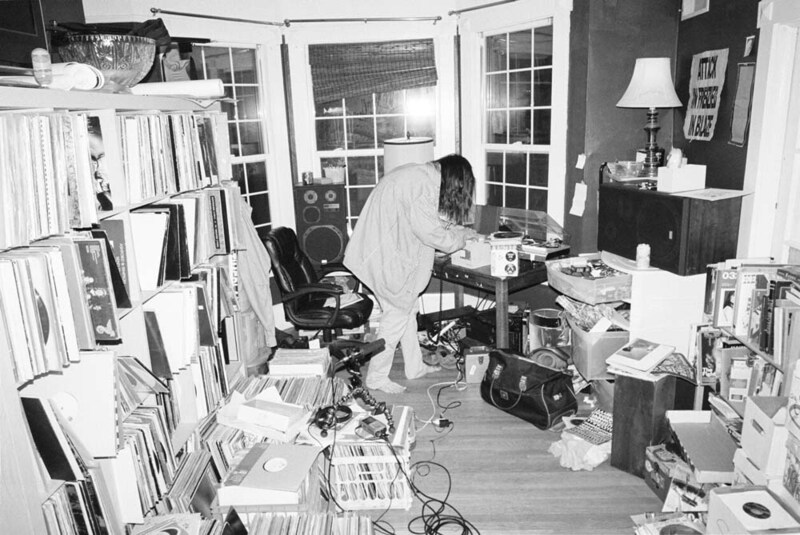 Raphael Villet has also produced a 48 page zine of the project, titled "Bay Area Record Collectors." 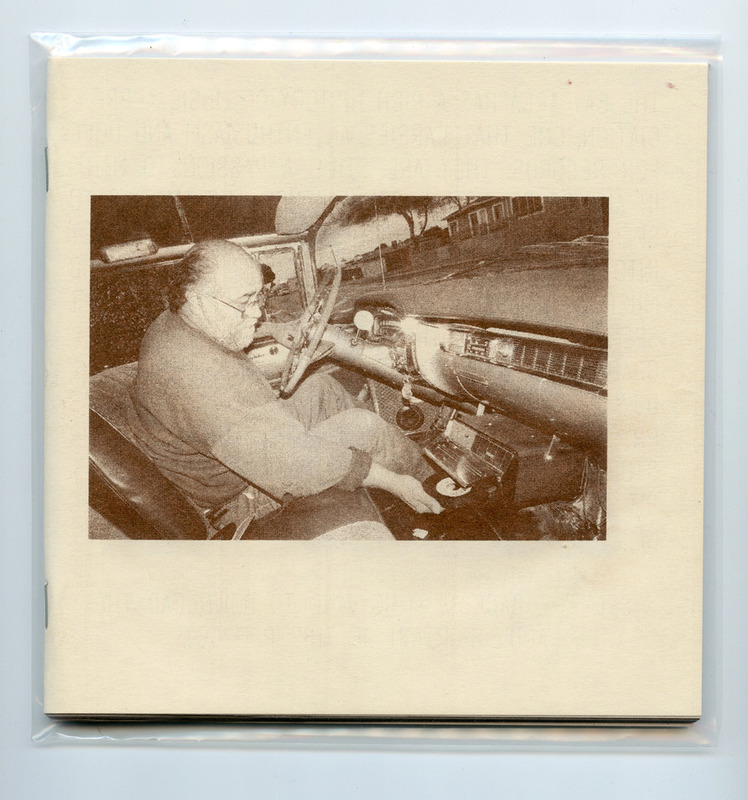 It includes photographs and a download code for the full audio component of this project. Printed at the Berkeley Art Museum at "The Possible" exhibition. Risograph printed on Newsprint. Available on the artists website here. Raphael Villet, raised in San Francisco, now lives and makes art out of his studio in Oakland, CA. 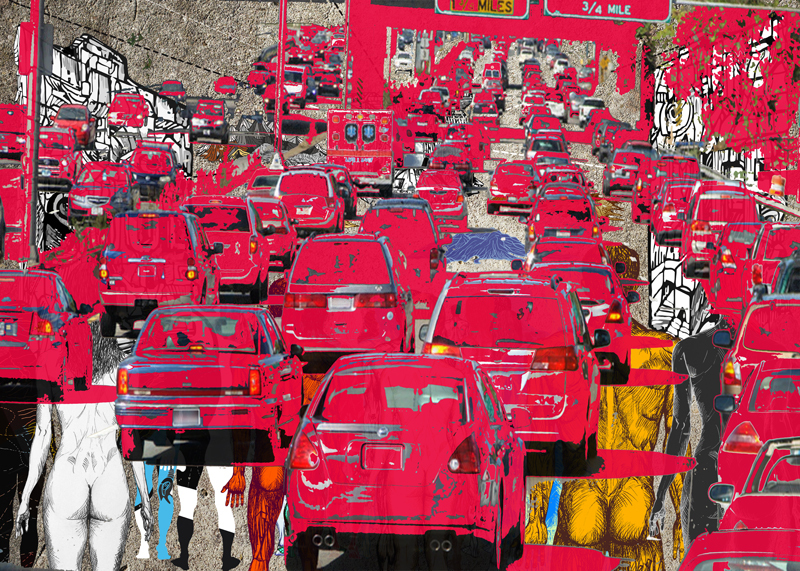 Working primarily with photography he has produced several solo and group exhibitions in the Bay Area. He has published artwork through HamburgerEyes of San Francisco as well as self publishing his own books and zines. He also makes video art and paintings and oscillates between making work that documents the lives of others and his own. SOD OFF Creative Weekends: "Each of the 6 creative weekends are facilitated by 3-4 artists who will collaboratively bring participants through a variety of materials, processes and experiments in keeping with SOD OFFs theme: Stories Of District & Of Family & Friends." About SOD OFF Dance & Performance Weekend (March 29-30): "The dynamic doctors are setting in, or rather are setting out to pull the performing protagonist from the petrified pessimist. Offering advice and guidance, tricks and gifts the artists will explore unorthodox methods of movement and performance to support your stories in their development. Whether transformed into energetic gripping gestures or mindful movement meditations these physical practitioners are here to help." Read more on the SOD OFF website. The explorative nature of the SOD OFF Dance and Performance weekend saw six very different sessions offer tools, techniques and tenderness for transforming memories into creative activity. After an introduction on active listening (a way of listening without judgment, opposition or stimulated imaginations distracting the concentrated focus of others), the first session, “Irrelevant Household Truths,” began with participants introducing themselves through an average household object. While sharing small anecdotes in pairs, a joint personality was formed with a new name and through a performed ensemble: one person doing hand gestures and the second introducing the new character. 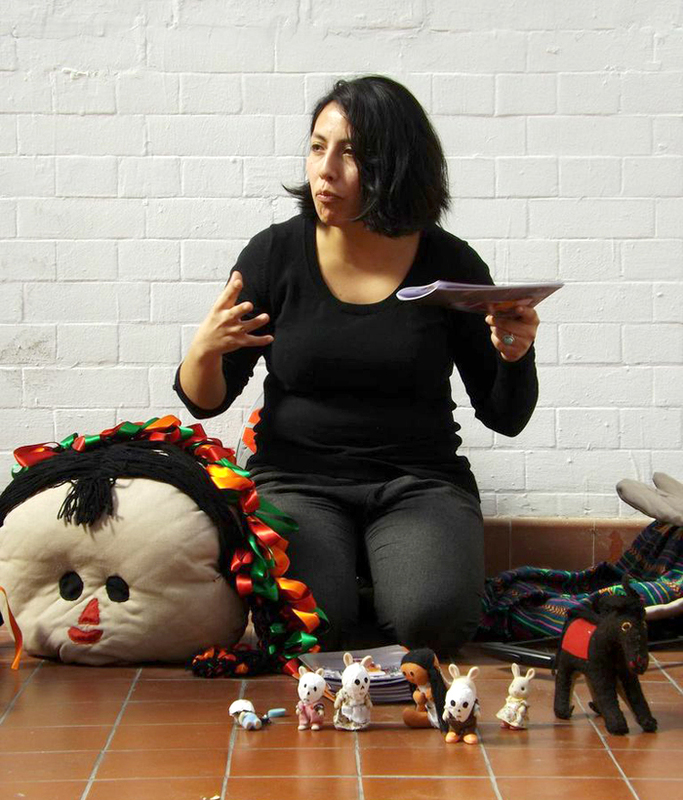 Leading the session, visual artist Veronica Cordova from Mexico introduced her work and a Mexican doll to the participants. Later, Cardova saw the doll come to life as groups took to writing its history through reenactments of stories they created. The next session, led by Greek artist Stavroula Kounderia, was all about truth. She drew on her background in performance with interests in testing individuals' capabilities for ‘being on stage.’ The warm-up for her theater session involved highlighting the audience’s relationship to an experience in the spotlight. Later, she directed the group to jot down three things they knew too be true, finding similarities among participants while working within groups to create a short piece . The piece incorporated the truths from the group, as well as other sources including a random page from the daily newspaper. The outcome was heartwarming and hilarious, ranging from performances in a garden chanting to plants to a story of a dramatic holiday romance gone wrong. In the day's final session, movement and dance artist Anthony Goh, brought the day to a close with some movement meditations. He offered four questions accompanied by music. The questions were based on Koans, or questions that are unanswerable though thought alone: What is Walking, What is Feeling, What is Choice and What is Performance. He asked the audience to let go of thinking as it arises through activity, instead allowing for the body to find its own answers through the movements. On Sunday dancer Kate Rubens kicked off the intensive dance day with some West African dance moves. Her direction was influenced by her experiences studying dance in both New York and Senegal. With drummer Kostis Alex Blintzios on djembe drums and the weekend's relaxed non-judgmental atmosphere, the group was led through a series of movements, which they where invited to make their own. The session ended with a lot of sweat and excited conversation. 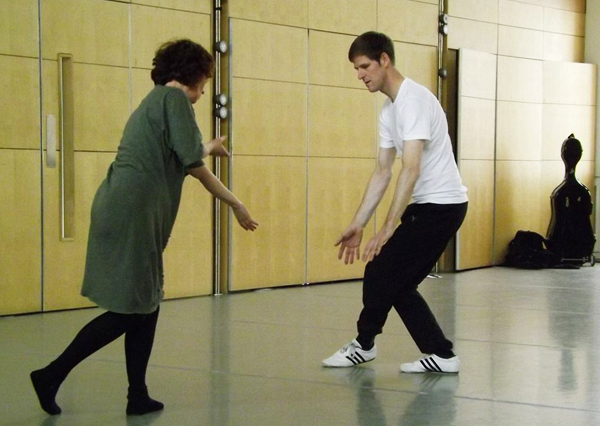 The second collaborative session included a combination of movement techniques for the piece, “Accessing Memory Fields,” by Nicole Cataldo Davies. This drew upon several types of contemporary improvisation dance forms such as “the Skinner Release Technique,” “Open Source Form" work, and “Access & Embody" work. The piece involved the embodiment of four body parts, bones, blood, muscles, and nerves, through physical movements. 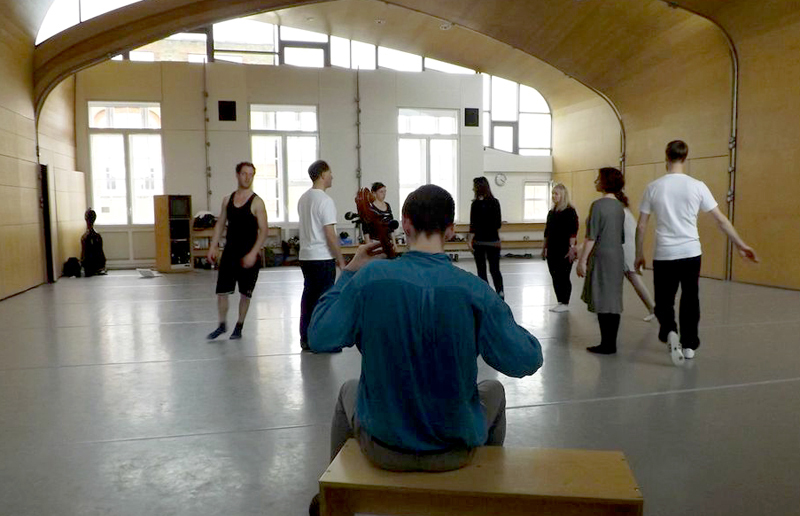 While moving between these bodily states to the sounds of improvised cello music played by Matthew Ratcliffe, participants could take time to reflect on or write about memories. The resonance of the cello with the architecture of the dance center's roof studio brought the groups' personal movements together, culminating in the participants dancing together as one body. After the session, this resulted in feedback from the participants focused on the therapeutic side of movement work. Following from “Accessing Memory Fields,” eurythmics expert Michel Hunter led a session on the experience of sound and music. The group reflected on the dimensional gestures of sound, such as the heightening and lowering of pitch, the left or right movement, the balance of the beats, and the forward and backward qualities of melody. This brought up realizations about the direct experience of movement to music. Using the octave as a starting point and noticing where in the body the music notes resonated, the group worked together in the movements choreographed by Hunter. This produced a sense of community discussed during the feedback session. Exhausted, yet inspired, participants offered their insights and experiences as the day came to a close. They were reminded that group movement creates a safe space for self-expression. It also allows us to assess where we are on our creative journeys and how collaboration, sharing, and exploring aids personal artistic practice and development. 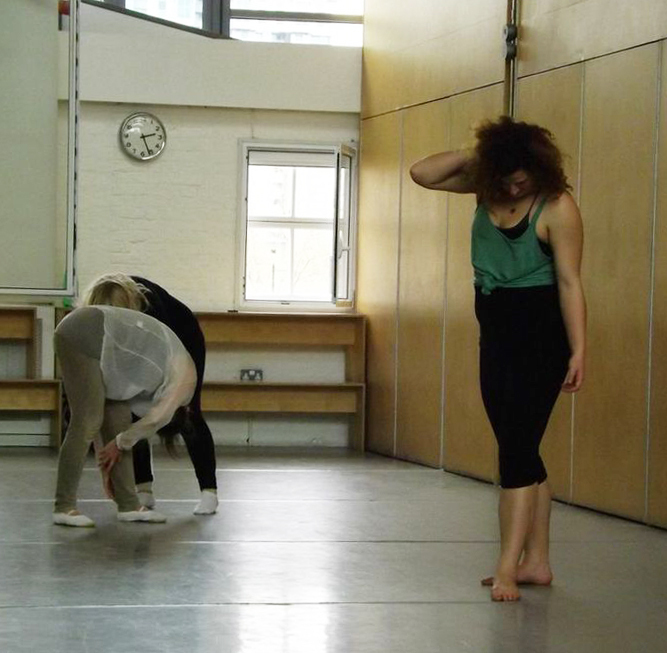 Nicole Cataldo-Davies is a UK-based artist, teacher, performer and choreographer. She completed a Masters in Social Sculpture in 2012 from Oxford Brookes University. Read more about her work on her website. 3. To facilitate an interactive environment where consumers meet producers. The goal of this project is to connect the consumer to the source of their food by informing them about the production process, which includes the land, people, soil, water, funds, methods, processes and passion. In order to recognize intrinsic value, consumers need to be educated about the intricacies of food production. This will create a sense of the true value of the food they consume, and lead to more personal accountability to their health. Farmers and Me includes fourteen video interviews with farmers in San Diego. View the videos here. The Guides for Responsible Seasonal Consumption are resources in the form of printed brochures. 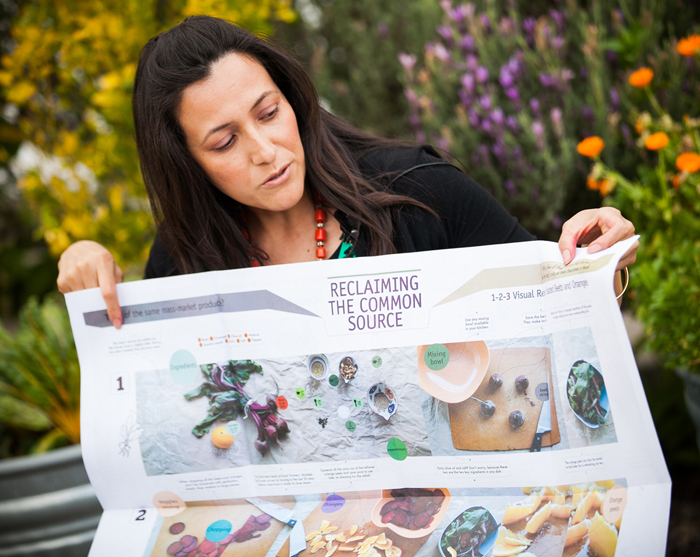 The set of 4 guides was created to reconnect people in the community to the source of the produce that we buy everyday in grocery stores. With so many farms in San Diego and more community gardens being started throughout the city, it’s important to reconnect the community to the faces that are behind the produce we bring to our tables. These guides are intended for educational and commercial purposes. They have already been successfully introduced in farmer’s markets, local organic farms, libraries, and in academic settings, such as elementary school gardens, learning centers, and even universities. The guides seek to communicate with people, to facilitate interaction between the producers and the consumers in our community. Each guide includes a “1-2-3 Step” Visual Recipe that illustrates a simple way to cook the featured vegetable. They also personalize the actual farmers who spent time to grow and prepare these vegetables. The hand-sketched illustrations, revealing photographs, and simple language will make it easy for the average consumer to learn about each vegetable and its nutritional value. Cristal Chen is a San Diego-based artist earning an MFA in Graphic Design at San Diego State University. Read more about her project here. Writer Gabriele Dow (poetry) from the United States and artist Patricia Gómez Álvarez (images) from Spain, also known as the collaborative duo The Pushers, discuss their recent series In Situ. View more of their work here. In Situ is a conceptualization of the political, economic, and social situation we believe currently exists in Spain. The pictures use children’s toys to represent real-life situations in a sarcastic manner, highlighting the simplicity in “complex” issues. At the same time, the pictures along with the poems provide a focused critique of the country’s situation and what can come of it in the future. Patricia Gómez Álvarez took the photographs, and I wrote the poems during my nine months living in Barcelona. The project was sparked by a discussion of the many scandals that have recently unfolded in Spanish politics, coupled with the suffering economic state of the country (which includes an increasing divide between the rich and poor), and the resulting social implications. The pictures were taken first. What is written does not necessarily describe each photograph, but the overall message in each pairing is meant to be the same. The concept of word vs. image is another that we’d like to present to the viewer. Ideally what is said or written and what is done or seen should go together, relate in some way, support each other. But from the mouths of politicians, this is often not so. The Pushers is a collaborative duo that often deals with social issues, presented as a play between word and image. See more of Dow and Alvarez's In Situ series here. "A Different Engine investigates weaving as the foundation of modern technology. Site specific to the Experimental Media Performance Lab, which is in itself a network of outlets, wires, and computers, this new work references the history of computing: a history which began shuttling in and out of the punched holes of automated looms. Jacquard’s loom, which gathered threads through punched cards to regulate complicated patterns, serves as a beginning for abstraction and investigation into the fundamental act of making. The holes in A Different Engine direct string to draw lines through space; mindless repetition amounts to something bigger than its parts. Deutsch’s instruments teeter between use and uselessness like kites that cannot fly. This work hovers in a place between theater and art as performers and viewers interact with the sculptural scape. 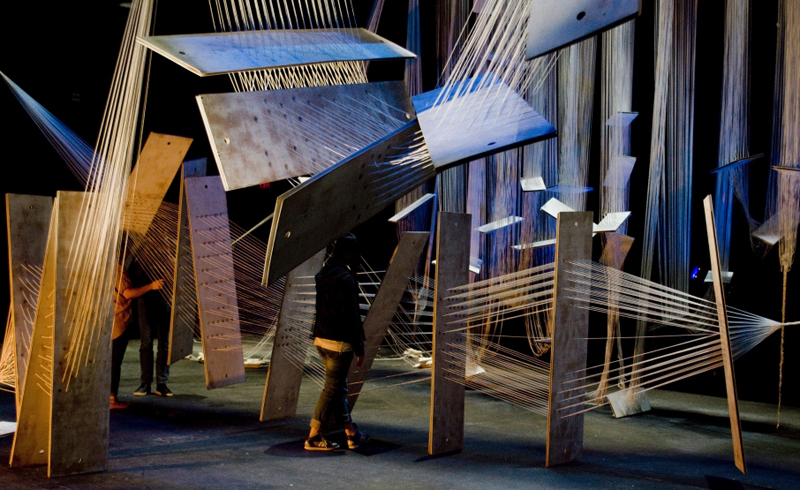 While a set is sutured to its play, the making of A Different Engine becomes its narrative. Viewers can wind, pluck, and touch the work. The machine-like objects become extensions of the body. The viewers become part of the machine, and both are in a constant state of flux." Silvie Deutsch is an artist living and working in Southern California. She is currently working on her Masters in Fine Arts at the University of California, Irvine. Check out her website HERE. Founded by Nicole Cataldo-Davies in June 2013: Sod Off looks to enhance the cross-fertilization of interdisciplinary arts through Social Sculpture methodologies. "Sod Off offers 6 creative weekends over 6 months from February 2014 to engage, inspire and ignite peoples living in London to tell their stories of place, race and heritage; "sod" also refers to the earth we came from. Creative Weekends will bring participants through a journey of storytelling via creative writing, poetry, music, performance, dance, sculpture, photography and video, resulting in a festival including an end show, open platform and exhibition. Sod Offs’ aim is to produce an archive of personal stories from across London through creative arts practice, inspiring a cross-fertilization of ideas and creative practices. The collaborative weekends will consist of 2 full days offering exercises, processes and experiments into storytelling through arts practice. Led by a collaborative group of artists, the two days will bring participants through a series of artistic activity developing participants personal stories. The project aims to engage members of the community from all walks of life, in order to offer a series of free artistic workshops, creating access to artistic learning and expression. exercises and experiments in order to spark the imagination and take your stories deep into their world of material. Artists: Jacob de Berker, Nicole Cataldo-Davies, Xxavier Edward Carter, Isabelle Cressy, Jessica Scott, Christopher Guest, Anthony Goh, Lorenza Ippolito, Eleni Kyriacou, George Montague, Kate Rubens, Gergely-Farnos Lilla, Kelly Fannon. The screen-printed books, Red and Blue, are an expansion on artist Rachel Marks’ series Color Language, which explores relationships between color, language, and sound, through paintings of recorded sound waves. Rachel Marks is a young artist living and working in Paris, France. She earned a BFA from Oklahoma State University during which she participated in an artist residency in Siena (2009) and studied abroad at the University of Hertfordshire in London (2010). After a year in Prague (2011 - 2012) teaching art to children, she obtained a Master’s degree at the Higher School of Art and Design in Grenoble, France (2013). Rachel has exhibited her work internationally in the United States, Italy, England and France. Visit her website here. 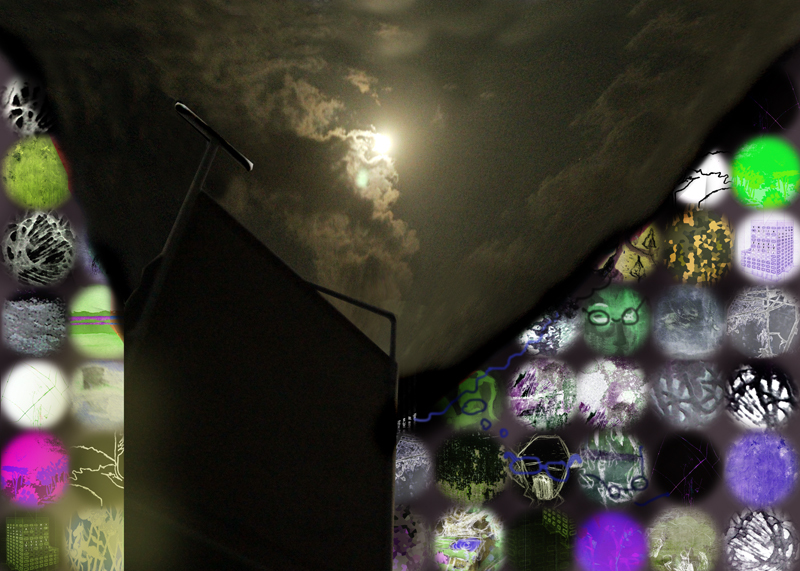 Check out the Emergent Art Space artist interview with Rachel Marks on the Forum. A project by artist 233 , the pseudonym of an artist living and studying in Seville, Spain. The following is a series of pieces created during an exchange program between the University of Seville and the International Academy of Art in Ramallah, Palestine. The main purpose of this project was to develop cooperation through making direct contact with the lived reality of the people in this region, and contribute to their peace process and the broader struggle for human rights. In the context of the Israel-Palestine conflict my fellows and I chose the word ‘Burgos’ (the name of a Spanish city) as a codename for ‘Palestine’ when we crossed any border or checkpoint controlled by the Israeli government or when we were in compromised locations in Israel, Jordan, or Palestine. The following are just some of the pieces that resulted from this collaborative works between Spanish and Palestinian young artists. Walk of Crescents. Street art. 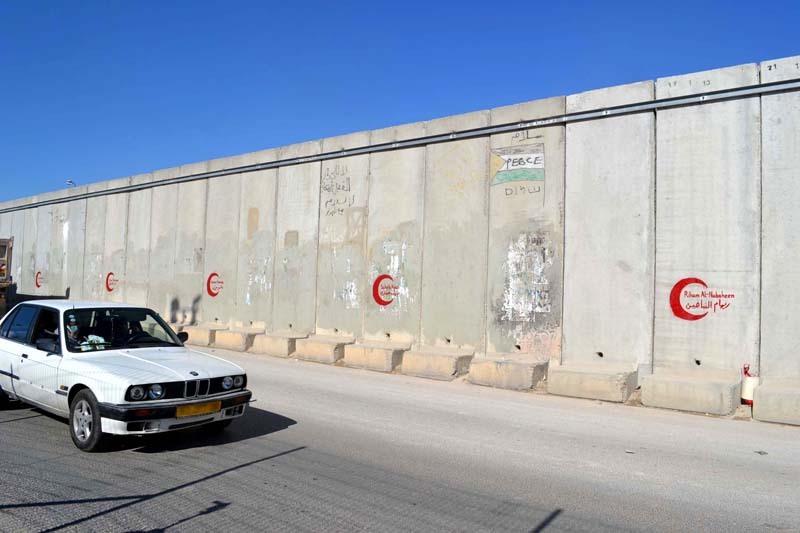 Ramallah City & Qalandia Checkpoint. 'Walk of Crescents' | Street art | Ramallah City & Qalandia Checkpoint. This piece was created in collaboration with Palestinian artist Heba Al-Baghdadi, and consists of a series of different paintings in red of the symbolic Palestinian crescent with a person’s name inside of it. The names correspond to ten Gaza children killed during the Operation Pillar of Defense launched by Israeli Defense Forces in the Gaza Strip, in November 2012. The work seeks to show this cruel reality through a “public shout” of these well-known names. The work also creates a distant, but powerful comparison with the popular Hollywood Walk of Fame in Los Angeles, California, allowing the spectator to reflect on the strong ideological contrast. Art students are the future. Video Art. International Academy of Art in Ramallah. 'Art students are the future' | Video Art | International Academy of Art in Ramallah. Looking to Gaza. Performance series. Aida Refugee Camp in Bethlehem. This project involved a series of participatory performances. The Aida Refugee Camp in the West Bank is known for its anti-war demonstrations, in support of the people living in Gaza. The participatory performance we put in place generated a visual connection between the Aida Refugee Camp and Gaza by means of forming an imaginary arrow with people’s bodies, pointing from one end to another according to a compass and to cardinal points. 'Looking to Gaza' | Performance series | Aida Refugee Camp in Bethlehem.